Langkawi is an archipelago consisting of 99 islands situated in northern Malaysia near the border with Thailand. Also known as the islands of legends, Malaysian children are all brought up with stories of Langkawi legends such as Mahsuri and the fields of burnt rice. Langkawi is a beautiful destination in itself, with mountains which look like the undulating spine of a dragon, verdant rice fields, quaint traditional villages and sandy beaches. It’s also a popular water sports destination; from scuba-diving to jet ski island tours and kayaking in the mangroves. 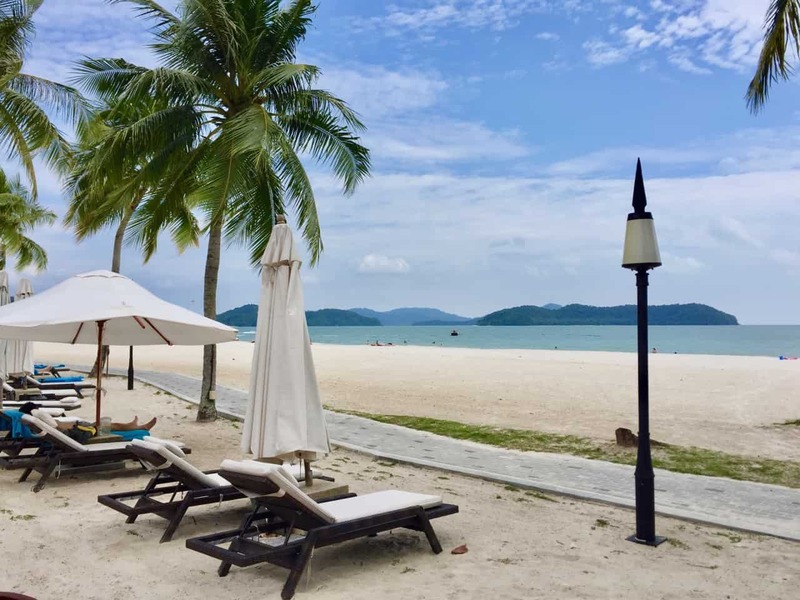 I’ve been to Langkawi several times before, and this time, to celebrate y Mum’s birthday, I chose to stay at Casa del Mar Resort on Cenang Beach, one of the most popular beaches on the main island. I tried booking a stay at Casa del Mar twice previously and finally succeeded on my third try! Langkawi is a one-hour flight from Kuala Lumpur International Airport. From the airport, it was a short 15-minute drive to Casa del Mar resort. The resort looks rather unassuming from the main road but as soon as the taxi stopped at the front door, two staff opened the doors and greeted us with big smiles, refreshing towels and a cold drink. Check-in was swift and we were soon led past the gorgeous pool, flowering shrubs and elegant palm trees, to our suites at the beach. The pool at Casa del Mar. The beachfront suites are for adults only and each has a little garden in the front. Glass sliding doors open to reveal a large suite, with a separate lounge area, and a spacious bathroom with a separate bath-tub and shower cubicle. The interior looked rather dated (for my taste) but it was spotless and comfortable. The best part though: as its name suggests, the beach is literally a few steps away from the suite! Cenang Beach is a long stretch of white sand with many hotels/motels, shops, restaurants and beach bars. I was happy to see that Casa del Mar is located at the quiet end of the beach, away from the crowds and loud music. We were invited for a drinks reception at the resort bar on our first evening there. It was a great opportunity to chat with the staff and other guests and we were spoiled silly by the bartender: he never allowed our glass of bubbly to go empty! Haha! I was very impressed by the staff, many of whom have been with the resort for more than ten years. They, from the gardener to the front office manager and the chef, made us feel very welcome by taking the time to chat with us and answer any questions we had. We made plans for a surprise dinner for my Mum and I loved how the chef came up with different ideas to make it a memorable evening. As the drinks reception wound to an end, we headed to the beach for the most incredible wonder: a sunset that literally left us quite speechless! Many people stood in awe and took photos of the sunset. Breakfast the next morning was a lavish affair. There was a small buffet with salads, breads, fruits and Malaysian favourites such as ‘nasi lemak’ (rice with a spicy prawn sambal, fried chicken and other condiments), as well as ingredients for a Bloody Mary or Screwdriver cocktail! We could also order dishes from the a la carte menu (the usual egg dishes and other Asian breakfast favourites). After breakfast, my sister and I spent several hours at the spa, indulging ourselves in a body scrub, massage and facial. Awesome! Our spa treatment kicked off with a foot bath. Me and my sis with our glasses of bubbly at the bar. We spent four fabulous days at the Casa del Mar. The staff’s great hospitality definitely made the difference. They made our stay feel like a homecoming – we soon discovered that other guests shared the same feeling; some of them had stayed there several times before. We went for walks along the beach, toured the island, went shopping for local handicraft (batik and wood carvings are popular souvenirs) and each time we returned, it felt like coming home. We greatly appreciated the little touches such as the turn-down service which included a fragrant bookmark left on the bed along with the next day’s weather forecast. 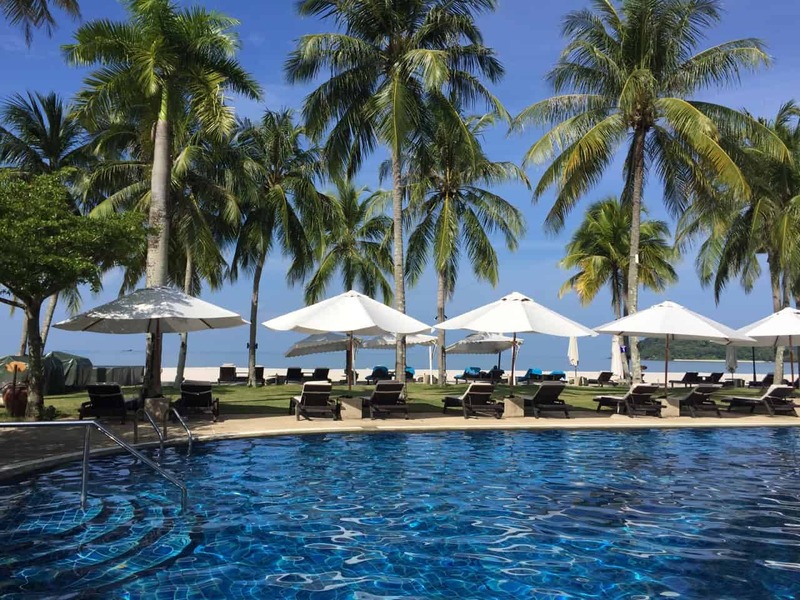 We also loved the resort’s quiet location and spacious rooms (we stayed in suites 304/305), not to mention the wide expanse of white sand at our doorstep, whilst the bustle of Cenang Beach is only a short walk away. The next time I visit Langkawi, I’m definitely going to try booking a beachfront suite there again! It’ll be like returning to my home by the sea! Check rates for Casa del Mar (Booking.com). A few weeks before we were scheduled to go to the Langkawi for vacation! Hope to spend a great time. Stunned by the beauty of the beach, what a scintillating sight. Loved it. Thanks for sharing!